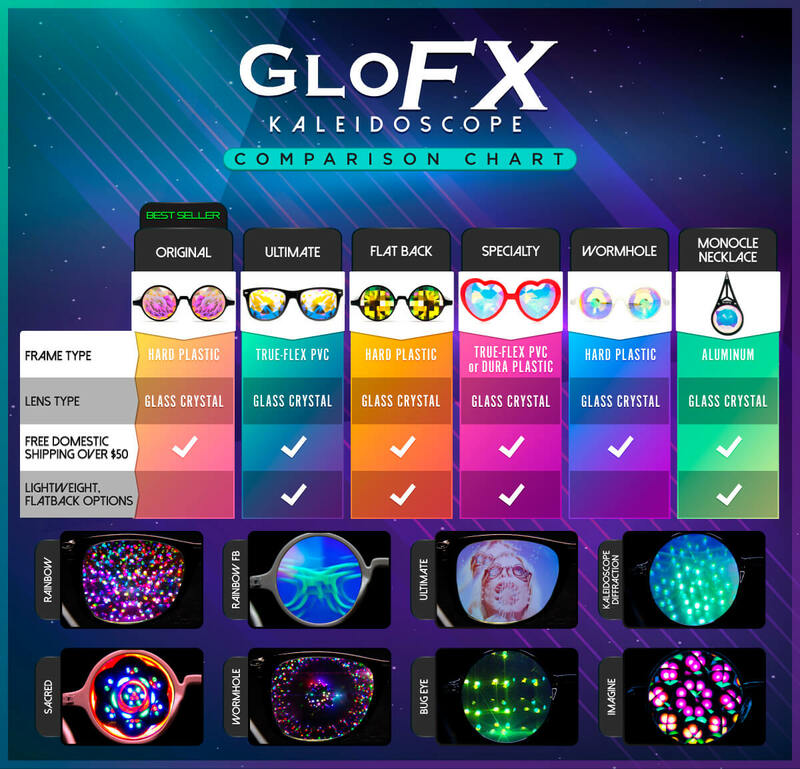 GloFX Rainbow Bug Eye Kaleidoscope Glasses will transform your reality into a multi-dimensional fantasy. Our crosscut pixel design is modern and attention grabbing. With thinner, flat back rainbow crystals, this style will feature more clarity and a less intense effect than our regular Kaleidoscope Glasses. Our Bug Eye glasses have a lighter weight streamlined design yet still produce an epic Kaleidoscope effect. This lighter weight model is easier to transport and will stay on your face even at the craziest of times! With its prism glass lenses and stylish frame, the Bug Eye kaleidoscope crystal is sure to stand out. See rainbows through a pair of GloFX Bug Eye Glasses. Our Flat Back Kaleidoscope Glasses are hand assembled in a translucent clear frame. With its timeless look, these glasses are sure to stand the test of time. Each pair houses a thin crystal that will test your vision and make you question reality. Featuring stainless steel hinges and a clear finish, you can’t go wrong with this design. Each frame is carefully selected and paired with unique crystals, made from high-grade optical glass for maximum light transmission. You will not find a nicer pair of Flat Back Kaleidoscope Crystals in Bug Eye Glasses on the market today.